Most of us don’t really need any reason to travel and venture off to near or distant lands, but a great festival is as good a reason as any to plan a trip. 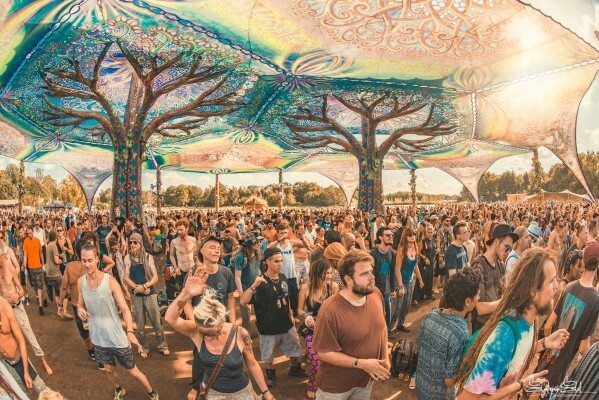 If you’re wondering where your next adventure will take you, why not head to a festival?! We’ve put together some of our favorite festivals around the world for your curious imaginations to ponder – some are food or music festivals, some are cultural festivals, and some are just plain crazy, but all are excellent reasons to pack a bag and go! Some of these are well-known festivals, and some you may not have heard about before or even imagined could possibly exist, but these are some of the best festivals in the world to put on your bucket list. 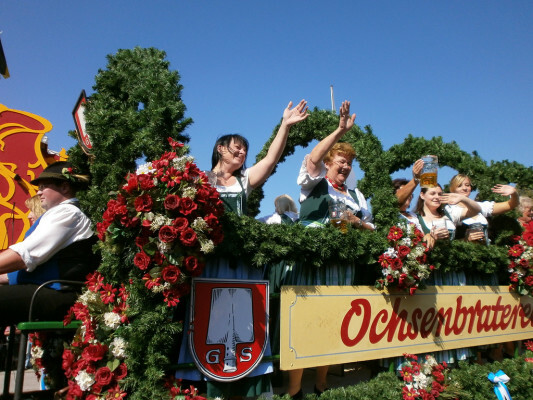 We start with a well-known festival, one which never fails to deliver a great atmosphere and fun times; it is, of course, Oktoberfest! Held every September in various locations around the world, the Daddy is held in Munich where the 186th edition takes place from Saturday, the 21st of September to Sunday, the 6th of October 2019. The biggest beer festival in the world sees 6.5 million revelers down nearly 7 million liters of beer – that’s enough to fill a little over three Olympic size swimming pools! It’s a hangover-inducing celebration of all things Bavarian which dates back to 1810. Get your lederhosen or dirndl on, get your drink on and soak it all up with pork sausage and chicken. Discover free tours in Munich, Germany. 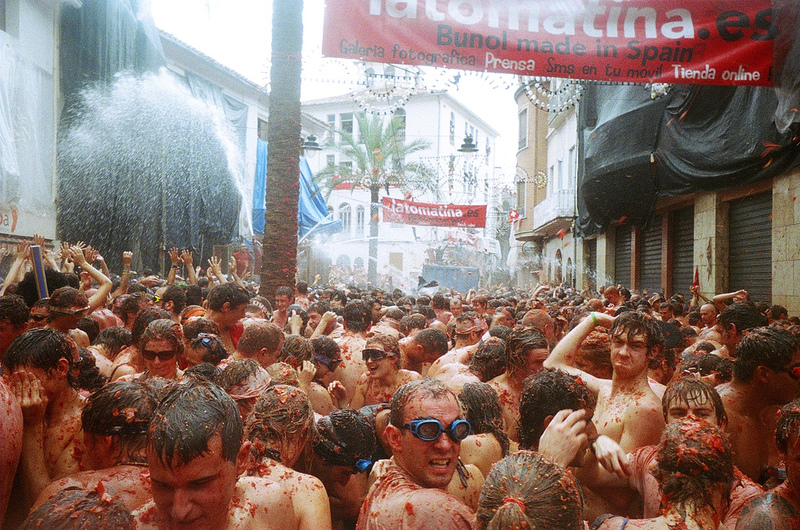 On the last Wednesday of August each year, the usually quaint and peaceful town of Buñol, less than 40 km from Valencia and about 3.5 hours by train from Barcelona, becomes the scene of what is essentially a massive food fight. Thousands of people from all over the planet will arrive to make missiles of more than 150,000 tomatoes and literally paint the town red for a messy, fun-filled hour on August 28th this year, and if you would like to be one of them you can easily take a day trip from Valencia or Barcelona. At 11:00, truckloads of tomatoes, more than 120 tonnes, are emptied onto the streets before being promptly picked up and hurled by the 20,000 tomato-throwers taking part in the madness. The origins of the festival go back as far as 1944, but the reasons for it are not completely clear – some say its genesis was in a juvenile class-wars food fight, a flurry of tomatoes hurled at a bad musician, the likely aftermath of a lorry spillage, or locals expressing dissatisfaction with councilmen by pelting them with the juicy berry; whatever the reason, there’s no denying the fun that is had here. If you go to Spain in August, this is definitely one of the festivals you must see. Discover free tours in Valencia, Spain. The first Sunday of April each year sees a rather unique festival take place at the Kanayama Shrine in Kawasaki, Japan. The central theme of the Kanaymara Matsuri Festival is the phallus and celebrates this in illustrations, decorations, candy, carved vegetables, and a mikoshi parade. It’s held to celebrate sexuality and bring fertility, healthy relationships, and, perhaps strangely, business prosperity. The parade consists of portable shrines adorned with huge penises and is the culmination of the festival which prides itself on being an event for everyone to enjoy regardless of culture, beliefs, sexuality or identity. Discover free tours in Japan. If one hour of tomato throwing is not enough for you food-fight fanatics, how about three days of throwing oranges?! 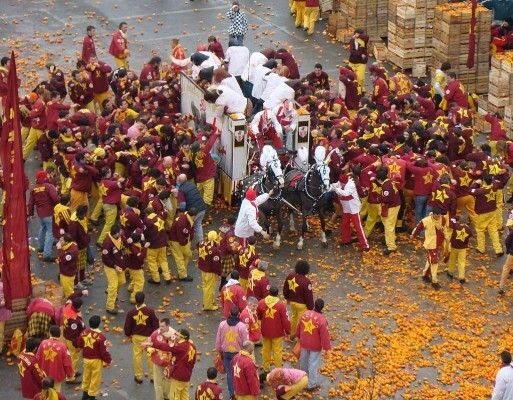 For three days in late February or early March each year, the streets of the medieval town of Ivrea, less than an hour north of Turin, turn thick with orange pulp due to the Battle of the Oranges festival which has its origins way back when in the 12th Century. It’s a celebration of a revolt against the tyranny of the Marquis who, legend has it, while attempting to have his way with a local miller’s daughter on her wedding night, had his head cut off by her instead. The annual festival sees nine teams of orange throwers, representing the townspeople, battle against the ‘tyrant’s henchmen’ who traverse the streets in horse-drawn carts, while 250,000 tonnes of oranges fly through the air. It’s pretty crazy, anarchy even, but a lot of fun for sure. You can only throw oranges if you are registered on one of the nine teams, and if you’re not throwing oranges you can avoid getting hit by them by donning a special red hat which indicates that you are there purely in a spectator capacity…..though, I can imagine it must be difficult to resist the urge to pick up a few stray oranges and get stuck in! Discover free tours in Italy. Oulu in Northern Finland boasts a rich cultural atmosphere and a self-proclaimed “big-city character with small-town coziness”; but that coziness turns to craziness for three days every August as it hosts the Air Guitar World Championships where everyone is invited to “make air, not war” and play air guitar for world peace at the end of the competitions. 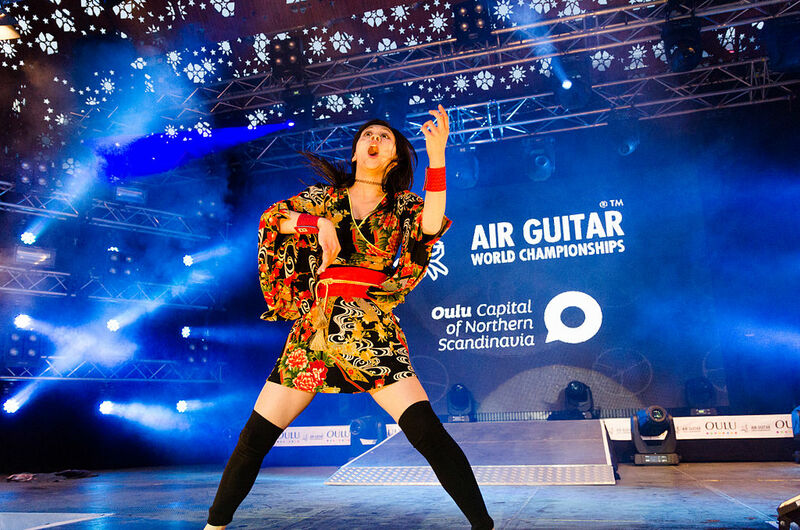 It might sound ridiculous, but the air guitar community is a huge international family and the event is a really fun occasion that brings people from different cultures and backgrounds together. There’s an unbridled joy about the festival and an element of pageantry and pomp rivaled only by that of the Eurovision. Entry for the 2019 championships, which take place from 21st-23rd August, is now open so dust off your favorite air guitar, get yourself to Oulu and keep on rockin’ in the free world! Discover free tours in Finland. In August, Leeuwarden in Holland, last year’s European Capital of Culture, hosts PSY-Fi Festival – five days and nights of Psychedelic culture incorporating music, dance, performance, art, meditation, and insightful explorations of topics such as psychedelics, psychology, ancient cultures, Shamanism, society, religion, permaculture, sustainability and more. 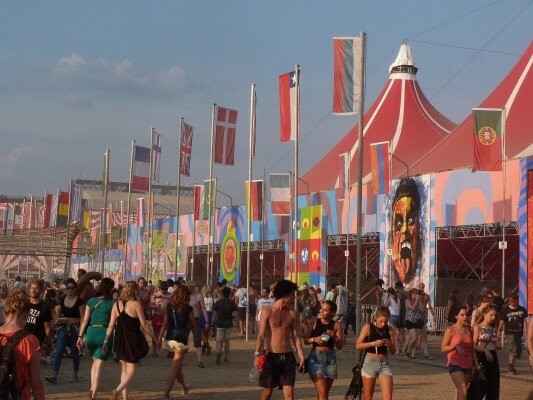 Set across two islands in De Groene Ster, Groningerstraatweg, the festival site includes five stages, six beaches, and lakes, and is accessible by shuttle bus from Leeuwarden, which is less than 2 hours from Amsterdam, or by airport shuttle bus from Amsterdam Schiphol airport. And, if you are tired of dancing to the wide variety of tunes here, you can jump up on the jam stage, grab an instrument and make some music with your fellow festival-goers, chill out in a hammock, take a dip in the lakes, and enjoy meeting new people from different places. Discover free tours in Leeuwarden, Netherlands. One of the most fun things to do as a child is a race. “Race you to the end of the street”, “the last one to school is a rotten egg” – there’s something liberating in indulging your inner competitor, just for the fun of it. 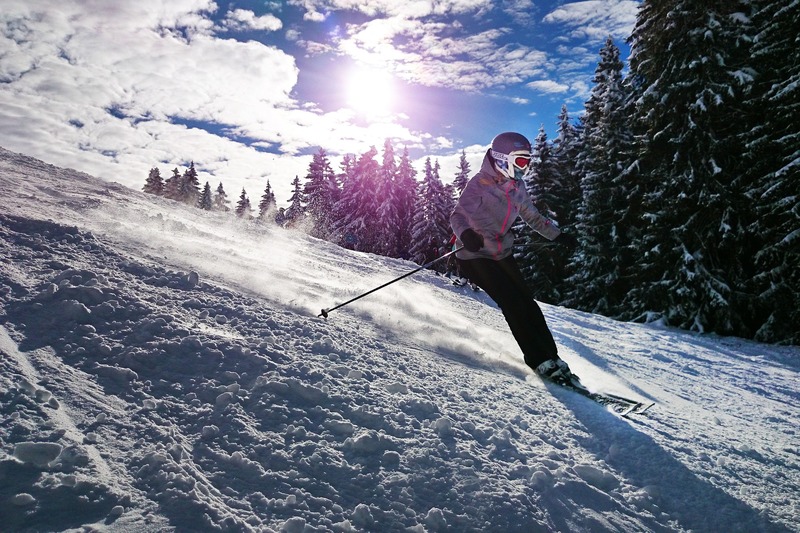 As adults (or bigger kids), there’s little opportunity for such pursuits without the trappings of taking things too seriously; thankfully, there’s the mad snow-race every January in Les Deux Alpes in France, about 70 km from Geneva. It’s as mad as the name suggests – a 5km race, in deep snow on an active ski slope, complete with obstacles like tire piles, tree climbs, and scramble frames, culminating in being plonked in an inflatable ring and pushed off a huge, steep ramp that sends you air-born and eventually cushioned upon landing by a big air-bag. Oh, and participants dress up in costume too – so you’ll be racing with clowns, penguins, nuns, and maybe a SpongeBob or two. It’s a lot of fun. Discover free tours in France. Each May, a little over half an hour from Hong Kong’s central district, the quiet island of Cheung Chau goes a little bit crazy. The Cheung Chau Bun Festival, added to China’s intangible cultural heritage list eight years ago, attracts over forty-thousand people from all over the world. The festival has its origins in happenings more than one hundred years ago when locals offered ‘lucky buns’ to ghosts they feared were hungry and causing a plague while parading through the streets in costume to drive the spirits away. Today, the festival involves people scaling a 45-foot-high A-frame tower to grab as many lucky buns as possible in three minutes. The buns nearer the top are worth more points than those lower down on the tower, and the most points accumulated wins. 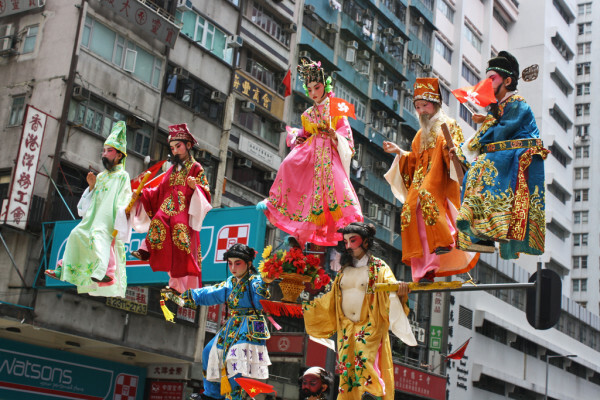 There are also multiple fringe events like operas & theatre, lion dances and colorful, carnival-like parades with pageants and floats, drums and satirical costumes. If you needed an excuse to visit Hong Kong, bun-based fun is surely the calling you’ve been waiting for! Discover free tours in Hong Kong. St. Patrick’s Day, the 17th of March, is world famous and celebrated across the globe – iconic buildings and famous landmarks the world over are lit up in green, and the Irish diaspora across every continent celebrate their national day in style with parades and parties; and while the day is marked internationally, no-where beats Ireland as the place to be on Saint Patrick’s Day, particularly in the capital, Dublin. Every year, the week leading up to St. Paddy’s day in Dublin is jam-packed with events and things to do as part of the Saint Patrick’s festival, such as shows, concerts, parties, special tours and the spectacular parade which takes place along a three-kilometer route through the city center on March 17th. And, being Dublin, the party atmosphere is in full swing too – gallons of Guinness are dutifully gulped while the many pubs are alive with traditional music and song, not too unlike a standard night in Dublin to be fair, but it’s turned up to 11 during the St. Patrick’s Festival. 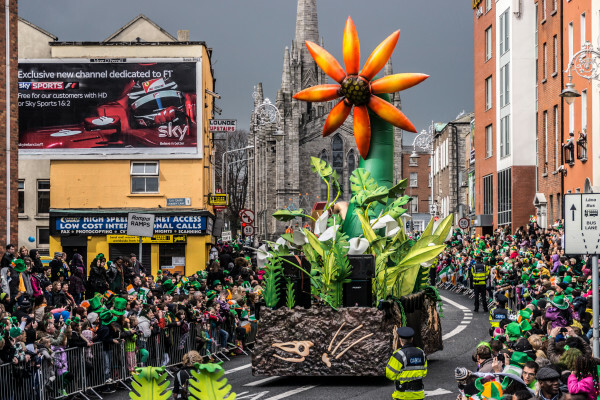 It’s an insanely popular time to visit Dublin, so you’d be wise to start planning your trip to the Irish capital for Saint Patrick’s festival 2020 now! Discover free tours in Dublin, Ireland. This is, without doubt, one of the highlights of the year in Budapest. The Sziget Festival sees big names in music and thousands of party-people descend on Óbuda Island in the Danube, at the heart of beautiful Budapest. This year, the festival runs from Saturday the 7th to the 13th of August and some of the acts to grace the multiple stages in 2019 will include Foo Fighters, Florence + the Machine, the 1975, Idles, Coheed and Cambria and a boat-load more. It’s not all just about world-class music either, the crowds that flock here from all over the world each year also come to experience art, circus, theatre, and multi-cultural collaborations that stir the imagination and excite the senses. As if you needed another excuse to visit vibrant Budapest, Sziget festival is a guaranteed good time! Discover free tours in Budapest, Hungary. There you have it, our favorite festivals around the world to get you in the mood for adventure and travel. Life’s short, so why not dance on an island, race through snow, climb a bun-filled tower, have a mass food-fight or show-off your epic air-guitar skills?! What are your favorite festivals? Let us know in the comments below.